Unfortunately, there is quite a lot to fear and be anxious about in the most recent State of the Union address and GOP response. The recent State of the Union speech by Obama, and its Republican response, are both remarkable for what they say as well as what they don’t say. The summary is this: The status quo will be preserved at all costs. Here are a few examples of the sorts of disconnects between rhetoric and reality that are absolutely toxic to the morale of all who are paying the slightest bit of attention. We’ve all paid the price for lenders who sold mortgages to people who couldn’t afford them, and buyers who knew they couldn’t afford them. That’s why we need smart regulations to prevent irresponsible behavior. It’s time to apply the same rules from top to bottom? Is Obama aware of what Erik Holder is up to over there in the Justice Department? The robo-signing scandal alone has thousands and thousands of open and shut cases of felony forgery that can and should be applied to as many individuals as were directly involved, from top to bottom in every organization that was engaged in the practice. Here’s the reality. 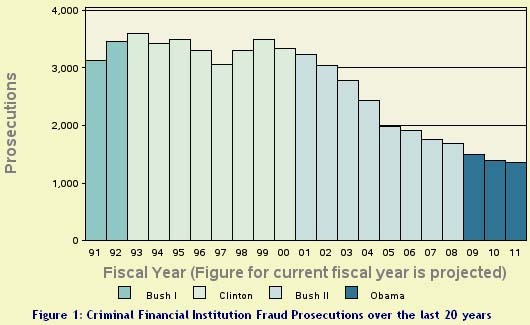 Under Obama, criminal prosecution of financial fraud fell to multi-decade lows during what is and remains one of the most target-rich environments in living memory. This article was posted in "state of the union", Chris Martinson, currency crisis, Debt, Deficit Spending. Bookmark the permalink. Follow comments with the RSS feed for this post.Post a Comment or leave a trackback: Trackback URL.